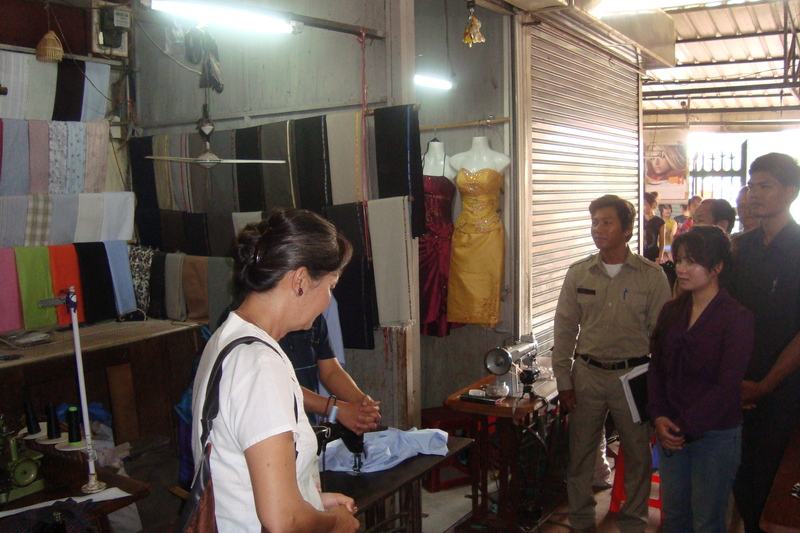 Psar Nath is the main market in Battambang town built by the French in the 1960’s. Early this week, over 200 vendors, mainly women marched to the office of the provincial governor. The governor has increased the rental of the stalls while business is slow. Over 1,000 vendors rent stalls at the market. Stories I heard when visiting the markets are similar from stall to stall. The business is slow. Farmers have less money to spend. Civil servants and workers can not afford to buy goods. The high price of gasoline is another factor affecting to the hard times of the market vendors. The market has no proper toilet facilities. Some vendors who can not afford to pay the extra dime for each time they use the private toilet facility must be creative and build a corner in their small stall that is hidden by a plastic curtain. To women, this is shame. There is a felt level of fear among those vendors who have spoken up. After I left the market, one of the most outspoken vendors was approached by the head of the market committee and scolded by the rest of the fearful vendors for having told me the truth. The issue will be raised at the next meeting with the governor by my local teams. We will continue to visit the vendors and inform them of their rights and engage them in developing strategies to continue the dialogue with the office of the governor. MP, Mu Sochua and her team of locally elected councilors were surrounded, harassed and threatened by deputy village chiefs and youth members from the ruling party, CPP while making door to door visits in Battambang town. The harsh words and accusation of incitement made by the CPP representatives were made to be heard and to demonstrate their total control of the villages. Their presence during the MP visit in the village spread fear. The CPP deputy village chiefs openly accused MP, Mu Sochua of inciting villages against the government when villages were informed of their rights to free public health care and education. The youth members directly threatened a villager who complained of loss of land when she was sick. “You, Mu Sochua can not enter my village. I warn you“, said a male commune councilor who was clearly intoxicated but encouraged by the other CPP representatives to abuse the opposition team. The opposition team filed its complaint to the governor the following day. A report of the threat will be sent to the Ministry of Interior next week by MP, Mu Sochua. 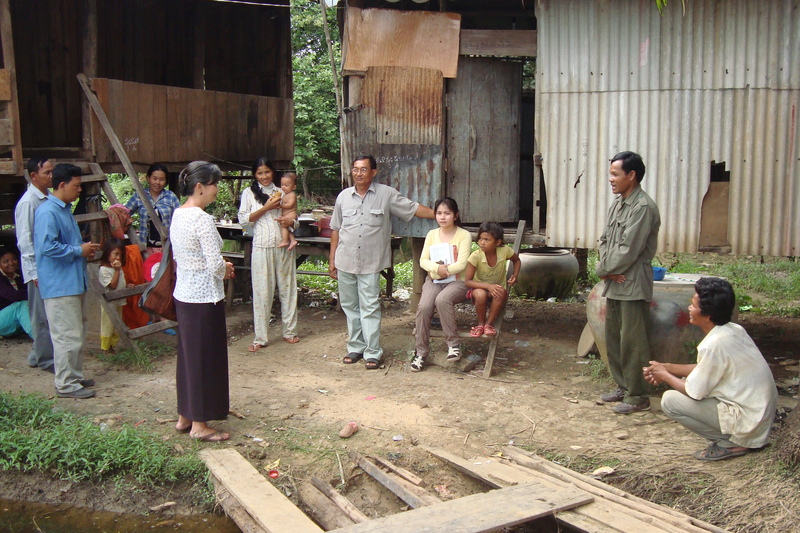 Similar to the Khmer Rouges regime, the level of control of the people is maintained by the village chiefs and other local authorites who represent the current government. 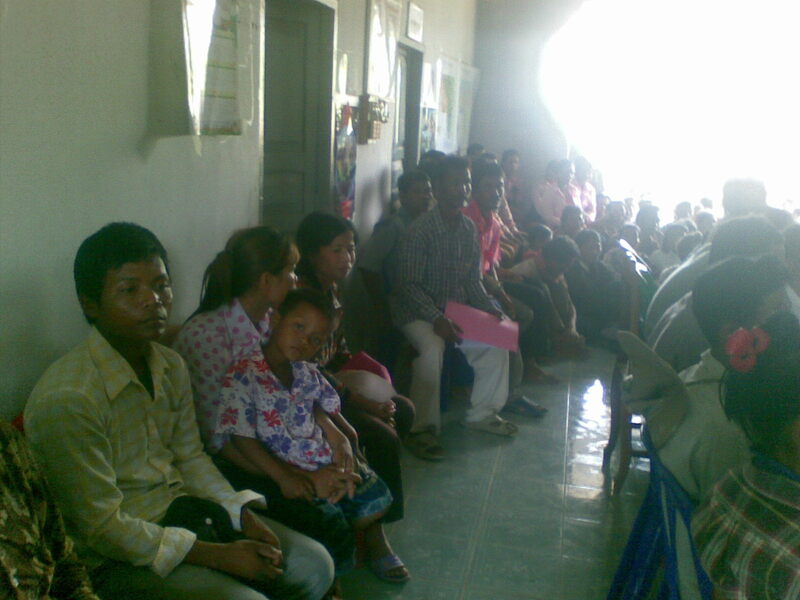 Fear is a legacy of the Khmer Rouges and a true barrier to the democratic process. Breaking the silence can be achieved by standing firm on the principle of rights to information, freedom of speech and by challenging status quo. The decentralization program supported by the international community must be measured in terms of the people’s exercise of their freedoms and rights and not only on the number of roads and schools built. During 3 days, our team walked through 7 villagers in Sampouv Loun and Phnom Preuk districts and addressed over 1,000 villagers. 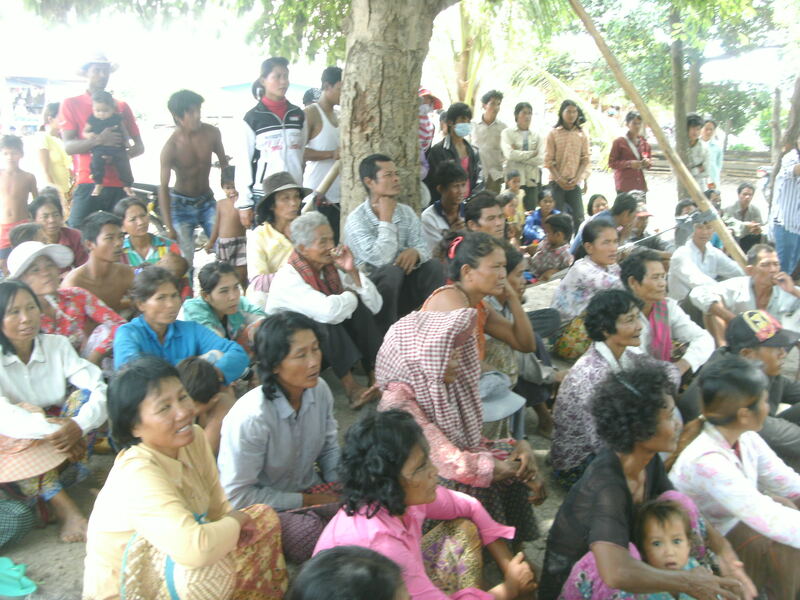 The district governor of Sompouv Loun, a man in his 50’s who joined the Khmer Rouge in his early 20’s was not welcome by the villagers when he led local authorities to meet with the villagers the previous week. When our team arrived the first day, the villagers were agitated as officials from the environment office have started to mark the land with wooden posts and clear 30 hectares of land for the company’s office. 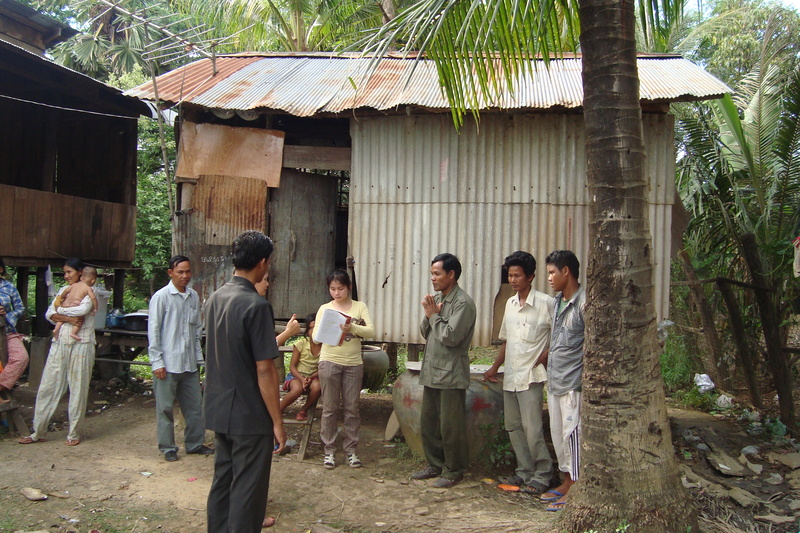 At each village, our team looked through documents issued by the government and informed the people of their content. 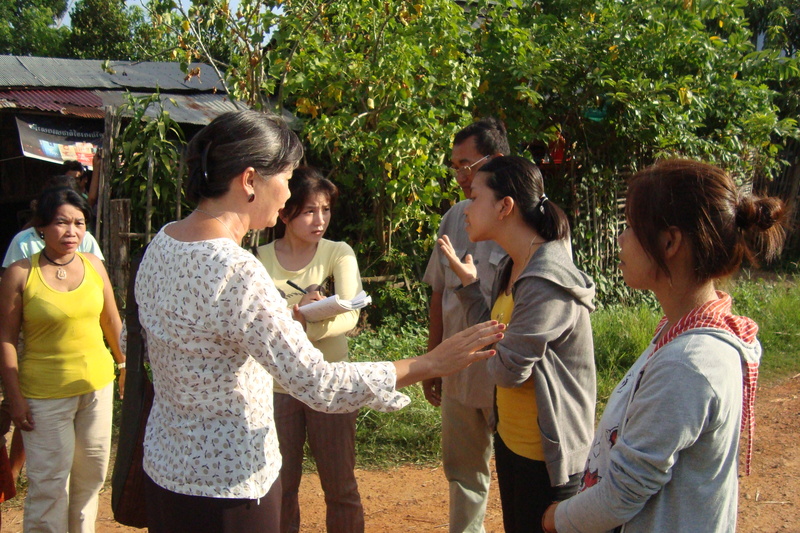 Villagers had never been informed of land concessions provided to the company. Economic land concessions are kept as secret by the government. All economic concessions are signed by the prime minister. 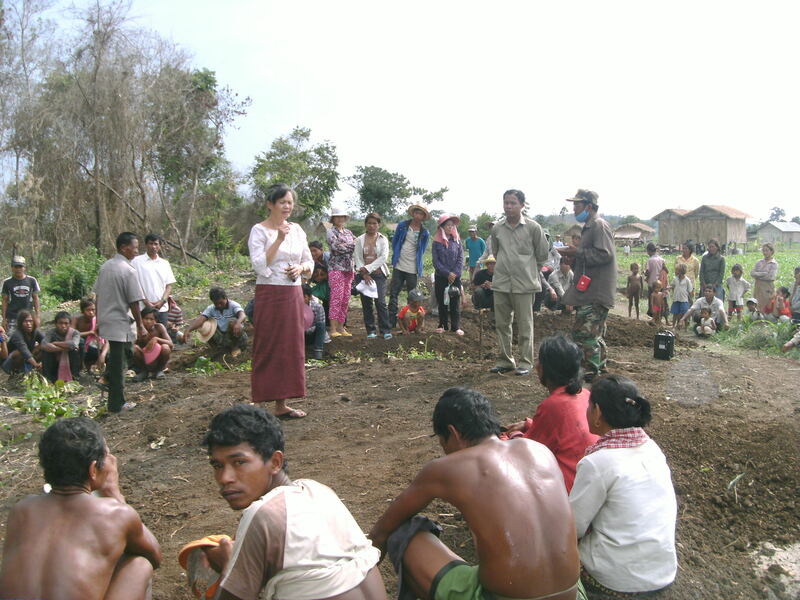 At each village our team held a public forum on land rights. Hundreds of affected villagers came. Women came with their infants and children, the elderly, and people men disabled by land mines as they cleared the forest. The farmers spoke with rage, in despair and want immediate cancellation of the economic concessions. “Our land is our life. We live off our land . We will die on our land” were the words from the villagers. The soil is fertile, Cambodian villagers farm all year round but the market is controlled by Thai companies. The third day was most significant: 700 villagers had the first meeting with their district governor at his office. Our team led and moderated the 3 hour long meeting. “Sisters and brothers, this office is your office. The governor is a civil servant. He serves you. You elected me as your representative. I serve you. Please make your requests and speak with no fear“, I took the microphone after the district governor gave his remarks. 8/ we want fair price for our crops. The atmosphere of the meeting was tense when the governor spoke of the government’s plan to divide the land. The villagers protested. My 3 young colleagues, recently elected at sub-national level played a major role in facilitating the meeting. They demonstrated a strong sense of maturity, analytical and public skills and respect for the principles of democracy. The villagers had never been received by the governor at his office. Every word at the meeting was recorded and heard. 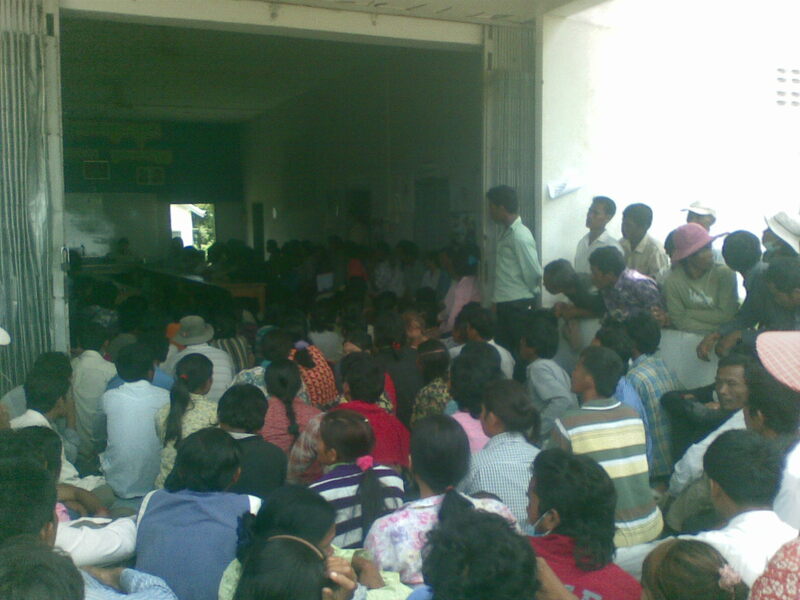 The villagers travelled more than 2 hours to reach the governor’s office. Our team moved on to the next district, faced with the same problem. At each meeting we played “Land is Life” a song composed and sung by the Messenger Band, a group of young women factory workers, students and villagers. Villagers from four provinces protested in the capital yesterday and handed officials a petition signed by more than 30,000 people opposed to land concessions in the Prey Lang forest, as activist and monk Loun Savath narrowly escaped arrest at the event. About 200 villagers from Kampong Thom, Preah Vihear, Kratie and Stung Treng gathered at the government’s designated protest zone, Freedom Park, to express concern over concessions in a forest they say is essential to their livelihoods. Activists waved banners, sang songs and marched, but perhaps most notable was their attire: green shirts, banana leaf hats and forest-green paint on their faces. Read the full article on the Phnom Penh Post website. Protests over land grabs by the powerful companies related to the tops leaders in Cambodia are happening on a daily basis. 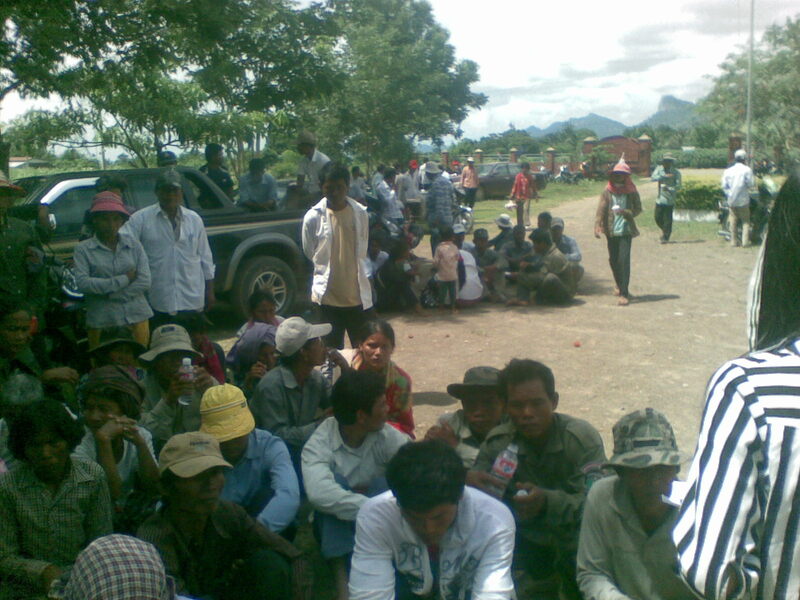 However, the action taken by Prey Lang villagers is the most powerful message. I truly believe that it is the beginning of a movement that the government can no longer control despite its heavy threats and crackdowns. The only solution is for the government to hear the message. Police in Sen Sok district blocked a march planned for yesterday by workers from the June Textile garment factory, who have been demanding severance payments since the facility burned down in March. Roughly 100 workers and activists gathered outside June Textile yesterday, planning to march to the capital’s Freedom Park and to government buildings. Read the full article at the Phnom Penh Post website. The company is reported to have received US$19 million. The workers will fight and go as far as call for boycott of clothes produced by the company, sold in USA and Europe. The plight of the workers is adding strength and power to the villagers’ determination to keep their land. Help them by sending letters of support. 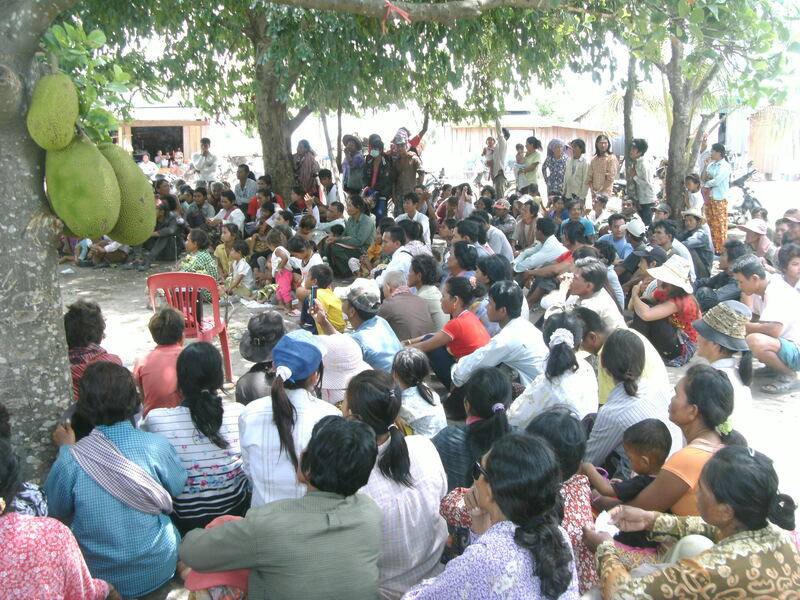 More than 500 villagers from Battambang province’s Sampov Loun district gathered yesterday to protest against a land concession of more than 4,000 hectares that they say will push them off their farmland. 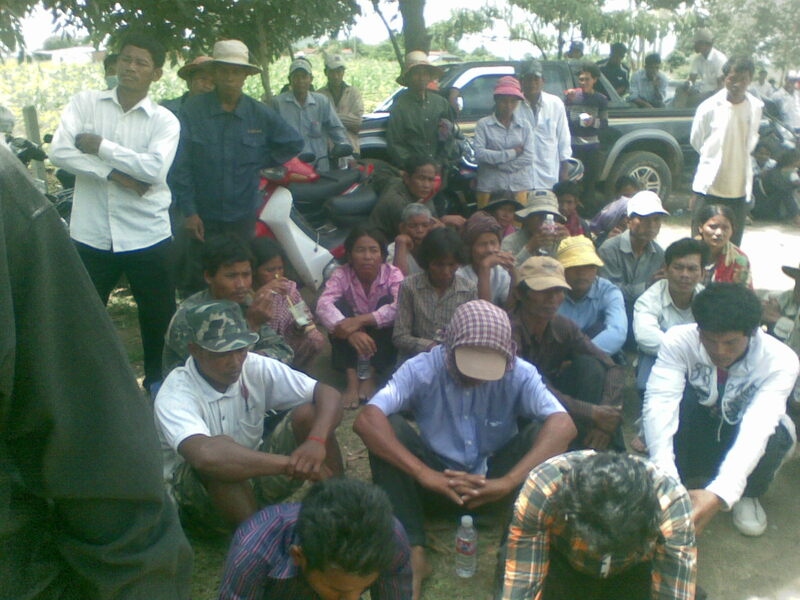 The villagers were joined by Sam Rainsy Party lawmaker Mu Sochua, who said the 70-year, 4,095-hectare land concession, awarded in March to Suon Mean Sambath Company, had been granted on the land of more than 1,000 families in Sampov Loun’s Serei Meanchey commune. Read the complete article on the Phnom Penh Post website. protected forest area under a royal decree. In search of land and a new life, thousands of destitute villagers from different parts of Cambodia moved their families West-ward to this new frontier of Phnom Preuk, Sompuv Loun, Kom Rieng and Pailin. The area was heavily mined by both the Khmer Rouges and the government during the war. Since 1998, the forest was cleared by the villagers. The clearing continues till today. Less than 10% of the forest remains. Families headed by women and people with disabilities clear less land than others. Land that has been cleared is unofficially owned by 1,500 families, representing 6,000 people. 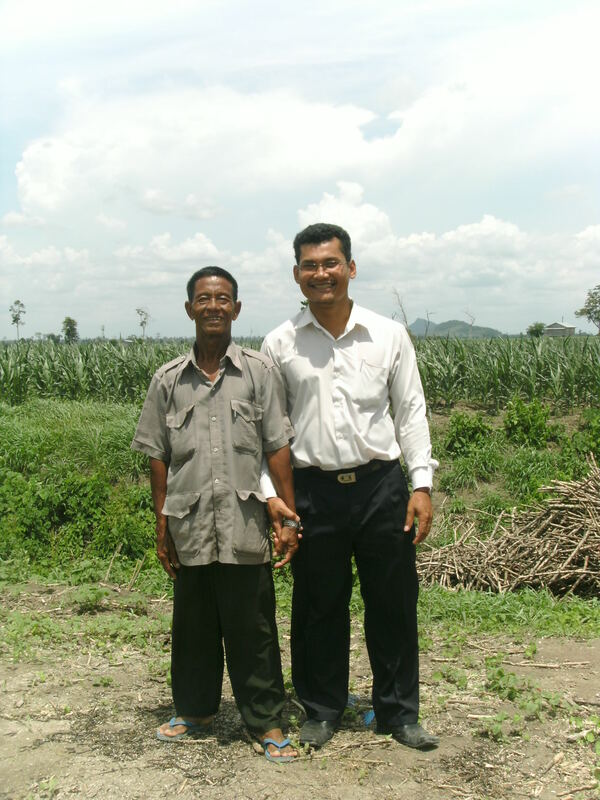 In May 2011, the prime minister signed off 4,095 hectares of the farmed land to Soun Mean Sambath company without any consultation with the villagers. Our team was contacted by villagers early last week, requesting urgent assistance. The opposition receives just around 10% of the votes at each election. The villages have no school, no health center, no drinking water. The people live in abject poverty and in fear of local authorities. I will continue to post regarding this issue. Please follow along.